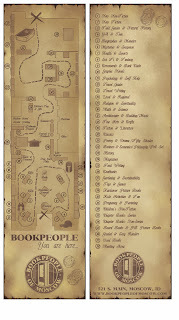 ILLUSTRATION: NOAH KROESE: Bookpeople Store Map: Thar She Blows. The first store map for Bookpeople of Moscow is ready to set sail. If you don't remember our previous voyage, I was asked by the good folks at Bookpeople of Moscow to come up with some store maps for them, which I was delighted to do. Maps? Cool. Books? Cool. Maps of books? Excellent. This project was a veritable treasure chest of fun. It would be hard to pick a favorite part. Maybe drawing the little doubloons, which each say "Bookpeople of Moscow" in tiny letters. And also making the map looked aged. When I was a kid I would sometimes "age" my drawings using tea bags. The process is a little more sophisticated now, but the result (a giddy, nerd of an illustrator having fun) is the same. Great good fun, says I (aye).